Cancer 2018 Horoscope denotes progress in the form of financial and professional gains. You would have robust energy & intensity in almost all your endeavours in 2018. This would pave way for your success. If you are planning to buy a new home, jewellery, or cars, then 2018 is quite a favourable period. 2018 promises to be an eventful year, full of passion and excitement for you. It is, however, advised to keep your ego in check as this might lead to some unfavourable and unwise decision making. In times when you are not able to take the right decisions, keep a trustworthy person close by and take his advice. This could prove very beneficial for you in the year 2018. Cancer 2018 predictions suggest that career would be at the top of your priority list. You would be making giant strides in success. You seem to have an aggressive approach to culminate things in a well defined manner. Your hard work, never say-no attitude and luck would prove to be the turning factors escalating you to immense growth and progress. Progress and expansion of your business appears to be a smooth ride till October 2018. Competition at work or other professional fronts pose no significant threat during 2018. Family looks to be your pillar of strength this year and meeting new people and clients at work could prove beneficial to you. Property and fixed assets hold key to some really good gains. Don't get too involved in partnerships as these might lead to minor issues & differences of opinion. Working solo should yield better results for you. You might face a minor bump in the middle of the year when it comes to career, especially between 27th June & 28th August 2018. However, keeping your ego low and taking decisions wisely should see you through this period quite comfortably. Overall it would be a promising and positive year in terms of career. Exceptional financial and professional growth is denoted with new ideas bubbling up after October 2018. Looks like, Cancer, you may have to wait a little more for the "right one" as 2018 doesn't appear promising when it comes to romance & matrimony. 2018 Forecast indicates health as an area of concern between May & August 2018. The inclination towards spirituality would be less and you may not experience comfort & satisfaction in romance. Some points of disagreement between you & your spouse/partner may arise. The mantra to maintain high spirits in a relationship is to keep the expectations low and level of understanding high. The time after October 2018 promises to be good for a new love relationship, however, July & August 2018 denote a particularly tough period in marriage. Work pressures & possibly infidelity could spoil matters between spouse/partner in June & September 2018. January Horoscope 2018 demonstrates a climb in rivalry for you. An ascent in your aptitudes may influence your coworkers to do likewise. Standoffs out of envy are likely and ought to be totally stayed away from at work place. Your spouse may encounter sudden temperament changes and hint at pomposity yet just briefly. Your business partners are likely to rope in money related benefits. Travel attempts might prove to be profitable. Possibilities of expansion for your business or work are on the horizon. Your companion may turn into an additional wellspring of benefits. You should relax on your body and rest when required. 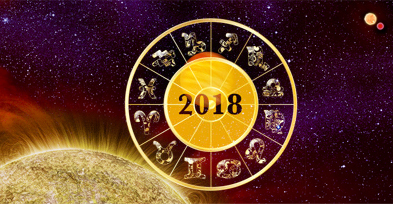 February Horoscope 2018 signifies of advancements for your life accomplice. Your life partner may encounter a positive change in profession or accounts. This may change their demeanor towards you during this period. Business attempts may wind up being profitable. Work partners may change openings into monetary benefits for your business. Progression in region of work is likely. Minor disillusionments on the financial front are shown. Accordingly, you ought to do well to deal with your assets carefully. March 2018 Horoscope implies a fortunate spell ahead. Fortunes may largely be supportive for you. In spite of scarce obstructions, income ought to stay stable in this period. You may have a tendency to have religious demeanor and may even undertake sacred ventures. Noteworthy spiritual learnings are feasible too. Sun may bless you with witty and mind-strengthening qualities. April 2018 Horoscope implies inner elevation. You may experience an added inclination towards religion, profound learnings, and sacred journeys. Fortunes may support you especially on the vocational front. Sun's elegance may keep on showering you with health and wisdom. A change in job should be discouraged during this time as a growth awaits you sooner than later. Household environment may see components of unsettling influence. Hereditary property may turn into a topic of disputes. You may gain resources for enhancing your financial status. May 2018 Horoscope radiates an impression of being a promising month. Budgetary gains are possible. Extra endeavors at work may bring fruitful outcomes. Succeeding on the career front is likely. Favors may stream in from the govt. Countless riches, stunning cash flow and a salary hike is anticipated. Residential life may stay uneven and might require extra consideration. June 2018 Horoscope depicts a saggy and inactive span ahead. Money related issues ought to be managed mind as odds of monetary misfortune are signified. Travelling for work is still on the cards. Finances may face minor mishaps regardless of the fact that general steadiness of funds may not be bothered. Chances of winning prizes are additionally indicated. Following philanthropy may help you in ways unknown to man. Being around with friends and family should rid you of your worries. July 2018 Horoscope appears to demand the best of your efforts. Cash related advantages are likely from new pursuits. Nonetheless, your wellbeing may require additional care. Seasonal illness linked with skin or fever may hold you down amid this period. Be attentive this month and take good care of your wellbeing or you may need to shell out heavy expenditure for your improvement. Mostly, life may move at a lazy pace throughout this month. August 2018 Horoscope implies a time of changing pace. With slow development, you may see recuperation of your wellbeing and lost riches from the earlier days. Monetary profits may come in yet just through persistence and consistent self-efforts. You may see an ascent in stamina, which may additionally enable you to earn more benefits. Thriving is denoted for all sects of life. Societal position may enhance and a rise in pay is likely. Career may remain stable throughout this period. September 2018 Horoscope points at a period of bravery. Riches show indications of being on the climb. Even your family may see an ascent in name and repute. Accomplishments at work are likely and you build up a temperament of self-awareness amid this period. Monetarily, the status may stay solid and your choices would be respected at work. With the willingness to learn, you may have the capacity to make material accomplishments. Profession angles look promising. October 2018 Horoscope demonstrates that you are in all likelihood, going to show a solid identity all through October. Your family may end up performing exceptionally in their respective lines of work. Inclinations towards the sacred world might take on religious trips. You may have perception and vitality. Your major dependable qualities may help you acquire respect at work in this period and your designation at work place may see a climb. Your success might induce jealousy among colleagues and you should carefully avoid any clashes with them. November Horoscope 2018 denotes indications of growth for you. You are well on the way to prosper in your position at work. An increase in popularity might be inevitable for you. You should keep away from any fights at work. For working people, great monetary benefits might be seen. New tasks may return positive results. Your network of accomplices may expand to new horizons. Students pursuing higher trainings may see favorable options from the govt. sector. Expecting parents should heed caution as slight hiccups are denoted. December 2018 Horoscope proposes a stunning picture for work. Employment holders may see money related advantages. Progression in work is additionally highlighted. Fresh projects may bring positive outcomes. Wellbeing may be affected because of minor sicknesses. You should avoid engaging with any lawful issues amid this period. Health might demand extra expenses. You should not acknowledge futile exchanges at work for a better career front.